Pork blended with honey, parsley and seasonings filled into natural sheep casings. Our sausages are made for us by a family owned business with a heritage of nearly 200 years of sausage making. They combine the knowledge acquired over generations with inspirational ideas from their chefs to create the very best recipes, all made with 100% British meat. 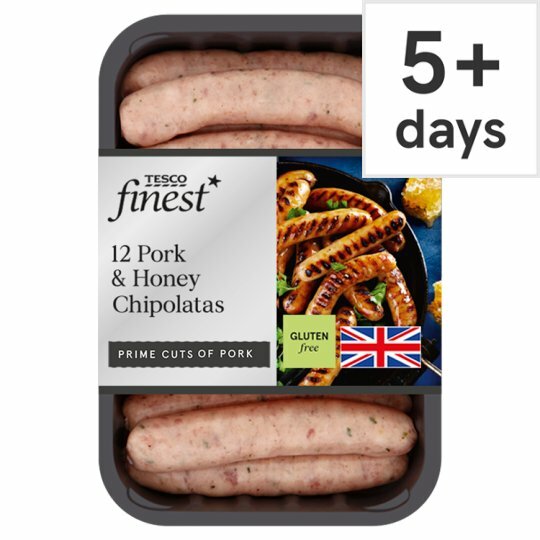 Pork (82%), Honey (4%), Potato Starch, Pea Fibre, Salt, Parsley, Emulsifiers (Tetrasodium Diphosphate, Disodium Diphosphate), Spices, Preservative (Sodium Metabisulphite), Black Pepper, Dried Sage. Filled into natural sheep casings. Keep refrigerated., Once opened, consume within 2 days and by 'use by' date shown. Instructions: Place on a baking tray in the centre of a pre-heated oven for 20-25 minutes. Turn occasionally. Instructions: For best results, grill. Place under a pre-heated medium to hot grill for 14-16 minutes. Turn occasionally. For best results do not prick sausage skins.